For the French long weekend, we drove to Provence staying in the beautiful medieval town of Avignon. 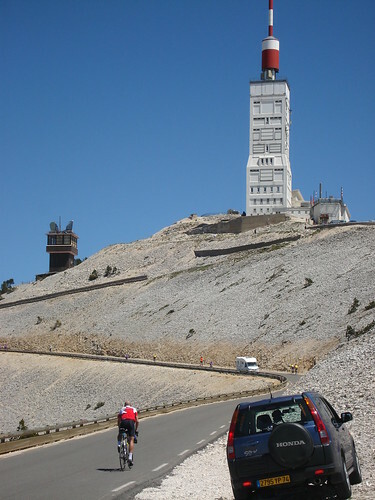 Friday I cycled up the legendary volcano Le Mont Ventoux. 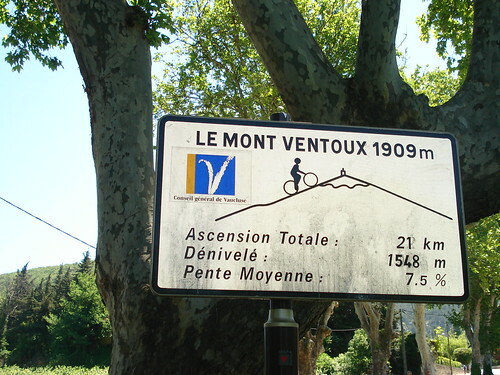 I have cycled ventoux before but never from the Malaucene side. This route is almost exactly the same difficulty as the more classic Bedoin route (21 kms, 1550 metres ascent) – this is a giant climb! 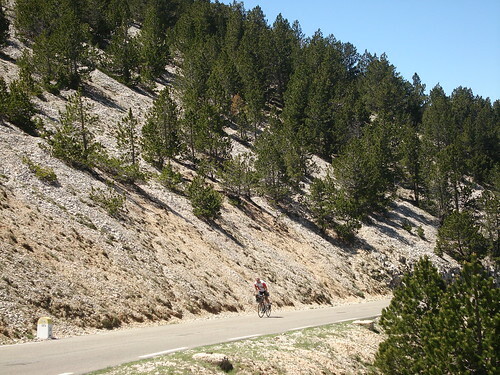 Ventoux is a cycling mecca and there were bikers everywhere. It was hot and this was steep, but I felt pretty good, and the only person to pass me (at the very beginning) – I actually caught about 18 kilometres later – which was fun. With Doreen as a photographer and handing me spare water bottles I was the envy of the road. There are long very steep stretches – hard work! With About 7 kms to go, the tree line begins to end and the lunar top of the volcano begins. The final kilometre – amazing environment. Personally found Maulaucene more comfortable mid-July 08 because of shade! A hard ascent even compared to Bedoin. 1hr53m -bonked half way-no food and only 500ml of water. However adjusted pace and recoverd. Made it from Malaucene to the summit on 5th August this year. 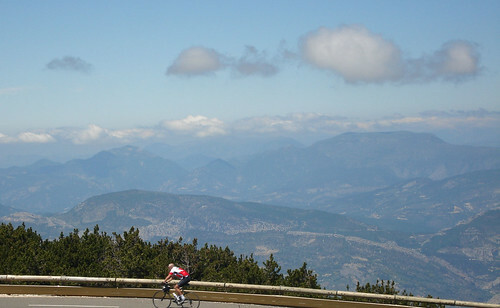 I cycle regularly, but had never attempted anything like this, and the reccy drive the day before put the fear in me!! Truly one of the greatest things i have ever done, completed on my brother’s 40th Birthday, with great views of Mont Blanc to inspire me – a summit he would reach by foot 2 days later. A mental and physical challenge, but one that has left me grinning still 2 weeks later. Looking forward to going back next year for the Bedouin route. We rent a house in Malaucène and we receive a lot of bikers. We think it’s a link interesting for your site. 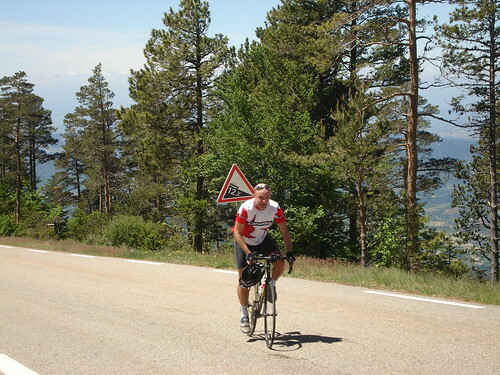 Cycled Malaucene side last week (end Sept 2011) and did it in 1.43 non-stop – amazing experience. Temp 30 degrees plus The steepness of the first 5km gets you and then you settle into your groove. Was overtaken by a guy going at pace within the first few kms and I wondered if I had enough training to do it. Got very tough at about 16km, then there’s a bit of relief when 4% gradient feels like you are going downhill. Caught and passed at 16km with ease my friend who had passed me at 5km – he hit the wall. Ran out of h2o at 18km but had enough to push on. Great feeling to come out of the woods, see the summit and go for it. Recommend holding back a bit for the first third, survive the middle third and then pump for the last third to arrive at the top out of the saddle and looking good!